Fish the waters of Cuttyhunk Island with Captain Russell Wright, owner and operator of LISA G CHARTERS. Cuttyhunk is a premier New England fishing destination located in Buzzards Bay, off the coast of Massachusetts. Known for record breaking Striped Bass, Cuttyhunk is the place to catch fish! Captain Russ specializes in fly fishing from his 2006-23' Jones Brothers Center Console. "Lisa G" can accommodate 1-3 anglers of all ages and levels of experience. Catch a lunker striper on light tackle, or get into a school of blues, Captain Russ will put you on the fish! Trolling and spincasting are also available. Bottom fishing for fluke and tautog trips can be arranged. Captain Russ is licensed by the US Coast Guard. All tackle and safety equipment are provided. Please contact Lisa G. Charters for rates. Captain Russ will happily answer any questions and supply information on transportation and accommodations on Cuttyhunk Island. Reservations are encouraged. 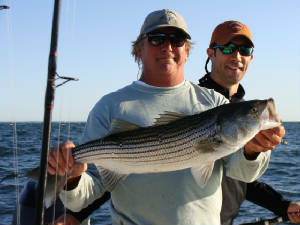 Captain Russell Wright will make your Cuttyhunk fishing charter a trip to remember!